When most roadside attraction-ites visit Bemidji, MN, the obvious first stop is the legendary Paul Bunyan and Babe the Blue Ox set on the shores of Lake Bemidji. And nearby the Paul & Babe statues are many more sculptures, including three separate Indians (one being a Muffler Man), a giant hockey player, and many other assorted pieces along Bemidji’s “Sculpture Walk” around the downtown area. But many often miss the Fireplace of States, inside the Tourist Information Center, only steps away from Paul Bunyan and Babe. 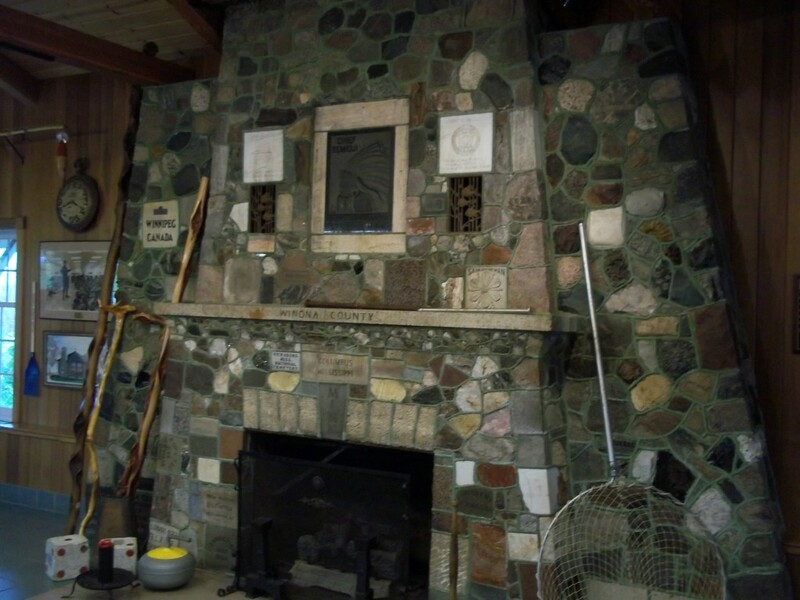 The Fireplace of States began in the 1920’s when a local resort owner named Harry E. Roese began collecting stones from around the state to be used for a giant fireplace at his resort on Lake Bemidji. 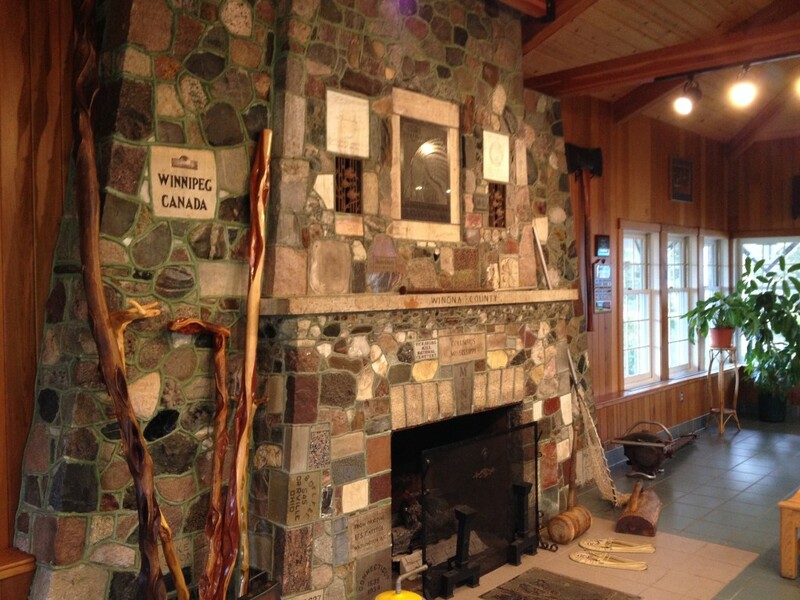 As his stockpile of stones grew, he went on to write hundreds of letters to state governors and officials, Canadian provincial governors, high ranking officials at our nation’s state parks, and even the President of the US, soliciting stones to be used in the fireplace’s construction. After the collection was amassed, he caught the attention of the US Federal Works Progress Administration. The chief goal of the WPA was to put people to work during the Great Depression, often building roads, structures, water towers, etc. In fact, many of the structures of Minnesota’s state parks exhibit this signature style of the WPA, traditionally hand-cut field stones and mortar construction. Things fell into place, and the fireplace was built under the guide of the WPA during 1934-35. Many of the stones have their place of origin embossed on them, while others have long since lost their attached tags. In fact, very little is known about many of the stones, as there was little info provided at the time, and even less available now. But it is believed that there are stones from every state, Canadian province, many national parks, and every county in Minnesota. And there is a story going around that it is missing one Canadian province, but no one knows which one since all of the tags have been lost. 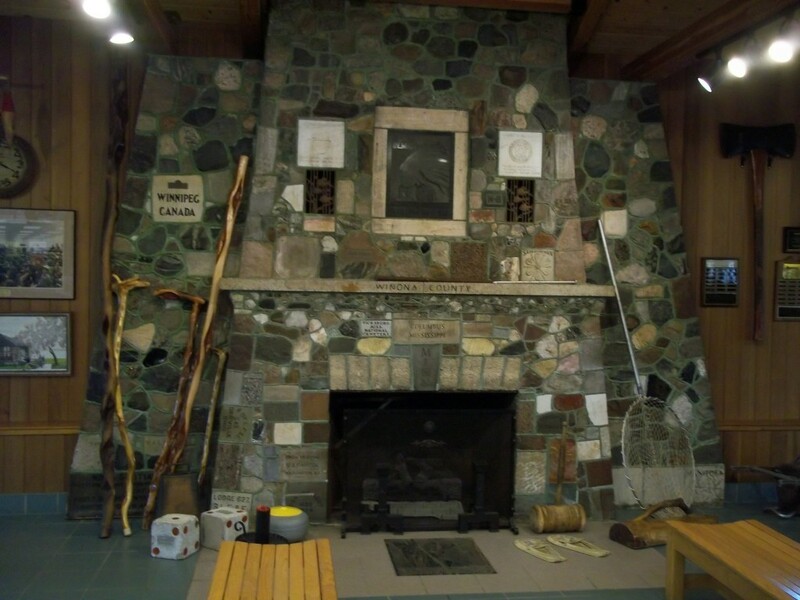 The fireplace was originally located in a log cabin at the resort but was moved to its current location in the Tourist Info center in 1995, where it will permanently stay. Unfortunately, the Tourist Center is only open during the week, Monday-Friday and between the hours of 8-5, meaning if you are in Bemidji over the weekend, you’re pretty much out of luck. So plan your visit during business hours if you can. In addition to the Fireplace of States, the Bemidji Visitor’s Center is also home to dozens of Paul Bunyan’s artifacts and his personal effects, such as his shotgun, toothpick, and boxer shorts. 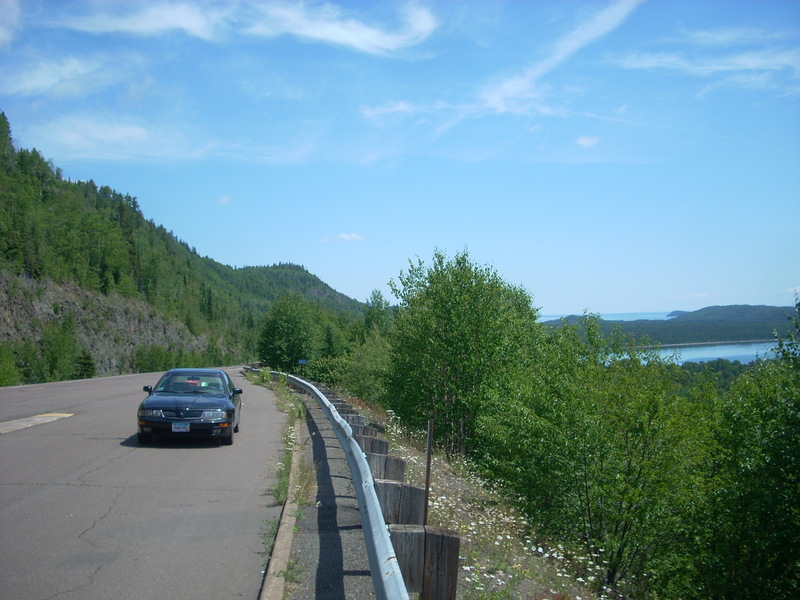 While in the area: Bemidji is home to plenty of roadside attractions in addition to Paul & Babe, and there is also the Concordia Language Villages Camp, whose unique architecture is worth a drive through. And if you haven’t got your fill of stone-built structures, Solway’s Miniature Stone Village is only a few miles away.